When you land on the island, you will be on Main Street. To the left of you, a man wearing a large top hat will be crying. Click on him, and he will assign you to the task of restoring the town to its former glory by finding out what’s happened to its prime export, carrots. Go left, to the carrot farm. Keep going left, until you’re in front of a house with a blue roof. Jump on the fence of the house, then onto the roof. Go down the chimney. Once inside the house, there will be a bowl sitting on the floor to the right. Collect it. Now leave the house, and go back to Main Street. Go right and enter the Carrot King Diner. Once inside, go left until you encounter a blonde waitress. Click on her, and ask her to fill your bowl with milk. “Empty bowl” will be replaced by “Bowl of Milk” in your inventory. Exit the diner and go back to the house. As you enter, you will set down the bowl of milk on the floor. Go all the way right, and jump on top of the boxes. From there, climb the wire that the light bulb is hanging from. Jump off to the left, into the bedroom. Keep going left until you get to the bathroom. Click on either the hot or cold knob on the bathtub, and a cat will spring out. The cat will run all the way downstairs and drink the milk. The cat will follow you now. Exit the house and go back to Main Street. Go right and enter Charlie’s Carrot Surplus Co. After you enter, you will give the cat to Charlie and in return, she will give you a crowbar. Exit the store. After you leave the store, go right, to the factory. After you arrive, go right and jump onto the ledge underneath the Carrot Cake ad. Jump onto the cylinder of green goo, and then onto the red pipe attached to it. From there jump onto the roof of the factory. There will be a blue piece of paper stuck in a window to the lower right of you. Drop down and collect it. “Vent Blueprints” is now in your inventory. Get back on the roof of the factory, but on the other side now. Keep going right until you fall off and onto one of the barrels floating in the water. 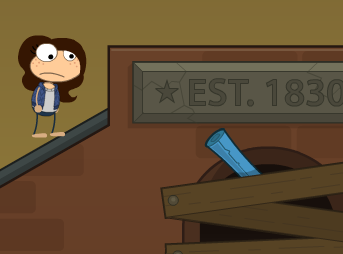 Click on the green tube coming out of the side of the factory, and your poptropican will pry it open with the crowbar and enter the factory. Go left. There will be a device that looks like a carrot on the ground. Collect it. “Carrot Transporter” is now in your inventory. 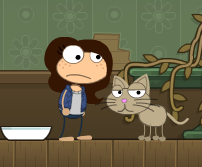 This can be used to transport your poptropican outside of the factory in case it gets into any trouble. Keep going through the pipes until you arrive at the red pieces that move up and down. You’ll need to time this right in order to get across. Once you make it, move up. There will be a large rat pacing the next section of pipe. 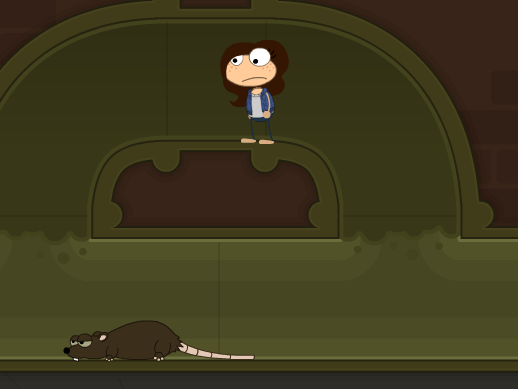 You can get past it if you go through the bit that cuts above the rat. Once you get past the pipes, go up. Go right, and there will be a master engine with three controls. Going from left to right, click the first control once. Click the second control twice and click the third control once. The room will power up. Go right and jump on top of the boxes, then onto the platform to the upper left. Jump on top of the barrels on the platform, then the boxes and wait for a magnet to come by. When it does, jump on it and ride it to the right side of the room. Jump onto the platform there and go into the vents. Use the blueprints to make your way to the processing room. Collect the wire cutters on your way there. After you enter, go down and there will be drones trying to catch you. Let them. They will bring you to the freezer. Above a box of carrots will be a small metal box in the wall labelled “Security System.” Click on it, and use the wire cutters to cut all three wires. Jump onto the taller boxes of carrots, and then onto the lamp. Enter the vent shaft again. Use the blueprint to make your way to the printer room. While there, you will need to make your way through the falling crates. After you get past them, you will need to fall off of the platform. You will most likely land on a mountain of carrot crates. Get off the crates and go left. There will be a girl with metal bunny ears on her head. Click on her, and ask her what’s behind her. She will then turn around and you will need to turn the bunny ears off. As a thank you, she will print you out a paper that tells you the system password. Exit the printer room (Tip: Instead of going through the boxes, just jump up a couple times). Use the blueprint to find your way back to the processing room. Once you get there, fall off of the platform. Since you disabled the security system, you will not need to worry about the drones. 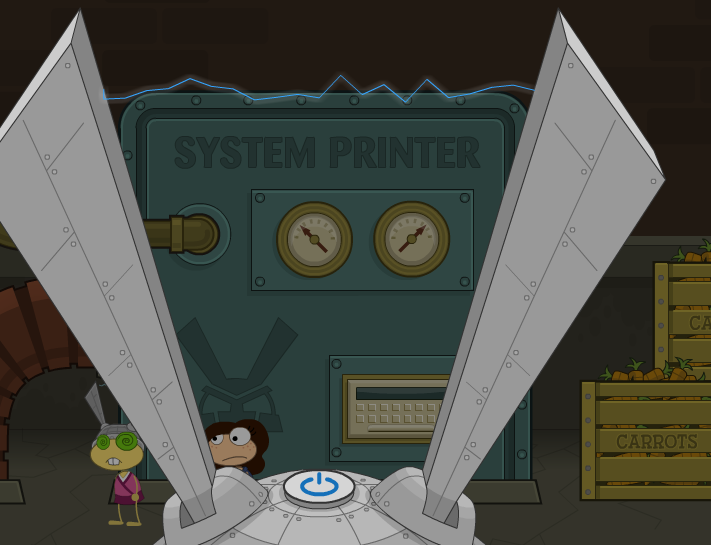 There will be two more mind-controlled poptropicans that you need to turn the ears off for. They will both remind you of the same thing: find bunny ears. Go right, and click on the door. However, instead of going through the door, you will fall into a trap door. The room you fall into is a potentially dangerous one. But as long as you time everything right, and dodge the orange stuff, you’ll make it to the other side. Jump onto the small pipe on the other side, and then onto the red platform. There will be a pair of bunny ears. Collect them, and put them on. Go up through the exit tube. You will appear back in the processing room. Go back to the door you tried to get into earlier; it will let you in this time. Dr. Hare will command you to start the launch sequence. Climb up the giant rabbot, and jump onto the platform with the giant computer on it. There will be a mind-controlled boy there, and you have to set him free before he will let you touch the computer. After he’s free, click on the computer. It will ask you for the password; type in “fuzzybunny” using the on screen keyboard. It will then ask for a command; type in “launch rabbot.” When it accepts the command, it will turn to a screen where you control the rabbot using a joystick. Try to make it hit as many meteorites as possible. Eventually the rabbot will explode, and Dr. Hare will be abandoned in space. After it exits our of the screen, leave the factory. 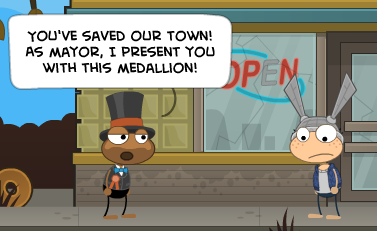 As soon as you emerge on Main Street, the mayor will give you your medallion.